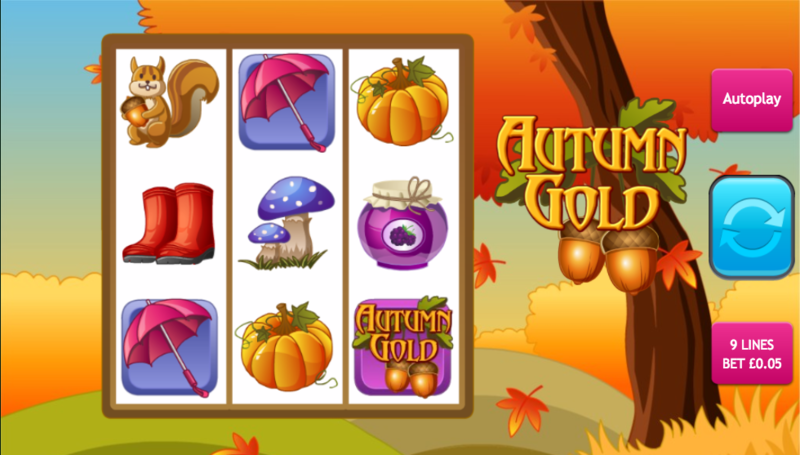 At first glance you might imagine that Autumn Gold is a traditional three reel slot with very little in the way of extra features but you would be incorrect – this game from Eyecon comes with a couple of bonus games and a lovely theme which celebrates the colours of this fascinating time of year. Autumn Gold is a three reel slot with three rows and up to nine paylines; the small set of reels leaves plenty of room in the background for fields and trees as they turn from colourful summer colours to a range of attractive browns and oranges. All the symbols are related to the theme and include owls, wellington boots, squirrels, mushrooms, pumpkins, jars of jam and the Autumn Gold logo. There’s no wild symbol but there are two bonus symbols – the maple leaf and the umbrella, both of which activate extra features. This is triggered by landing three of the maple leaf scatter symbols anywhere in view and you will now receive 8 free spins with all wins subject to a 3x multiplier. It’s possible to trigger more spins from within this round by landing three maple leaves again and you can do this a maximum of 15 times which would (obviously) mean there’s a total of 150 spins available. This is a picking round triggered by landing three of the umbrella scatter symbols anywhere in view; you will now receive three picks with each one worth up to 111x your total stake. Autumn Gold may sound like a seasonal real ale but in fact it’s a great little online slot with some clean graphics, nice gameplay and two distinct bonus features – check it out!